If the power to the floor goes down (no fault of ours as employees) we get sent home with no pay for the rest of our shift. I was told that I could use my paid time off to cover lost wages. I’m sorry but I didn’t cause your power outage why do I have to pay to cover my lost wages. I showed up on time intending to work a full 10 hours and now you are sending me home because you can’t keep your power up and functioning. Jeff Bezos is the richest man in modern history, by the way. In the hours leading up to the start of Prime Day, his net worth soared north of $150 billion. What’s especially worrisome is that Amazon is only getting bigger, and stories of employees who feel abused or disenfranchised are only becoming more common. On top of that, the Seattle-based company is starting to stretch its tentacles into new businesses, like groceries with its Whole Foods purchase and law enforcement with its new facial recognition software. This sort of expansion also begs you to wonder exactly what Amazon is doing with the ocean of user data that it’s been scooping up not only from its website but also through Alexa-enabled devices. Is it protecting that data? (Seems like maybe not.) Is Amazon profiting off of it? One thing’s for sure, though. You do not need to spend money on Amazon Prime Day. You don’t have to spend money on Amazon in general, but especially, not on this completely made-up celebration of capitalism. Heck, if you really need a reason, consider the fact that participating in Prime Day this year will effectively mean you’re crossing the striking Amazon workers’ picket line. Don’t be a scab! Shop at Walmart instead. Amazon is a fair and responsible employer and as such we are committed to dialogue, which is an inseparable part of our culture. We are committed to ensuring a fair cooperation with all our employees, including positive working conditions and a caring and inclusive environment. 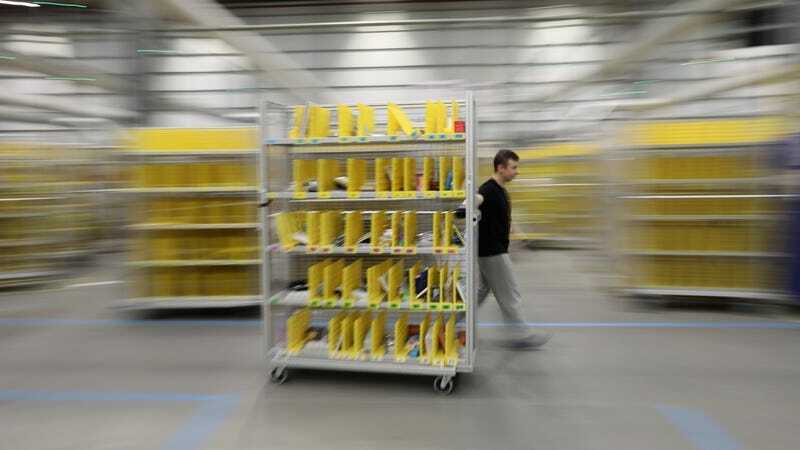 Amazon has invested over 15 billion EUR across Europe and have created over 65,000 permanent jobs since 2010 and provides a safe and positive workplace with competitive pay and benefits from day one. We encourage anyone to come see for themselves by taking a tour at one of our fulfillment centers — learn more at http://amazonfctours.com. So if you’re looking for a fun summer vacation idea, take the kids to an Amazon warehouse. Be sure to thank the workers!